Similar methodology to above, a data set of observed daily and monthly averaged precipitation, maximum and minimum temperature, gridded to a 1/16° (~6km) resolution spanning CONUS and the Canadian portion of the Columbia River Basin, with temporal coverage 1915-2011. The precipitation is adjusted for orographic effects using an elevation-aware*1961-1990 precipitation climatology. The complete data set including gridded meteorology and VIC simulated hydrometeorology is hosted on the Livneh Research Group server, as well as at the University of Washington server. 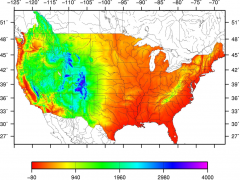 An interactive subsetting tool for the meteorological variables only is available at the National Oceanic and Atmospheric Administration (NOAA) Physical Sciences Division data page.